So, Paris! In the middle of our trip to Germany, we spent three days in Paris, visiting my friend Clarice, and taking Sandra's mum around as a birthday gift. 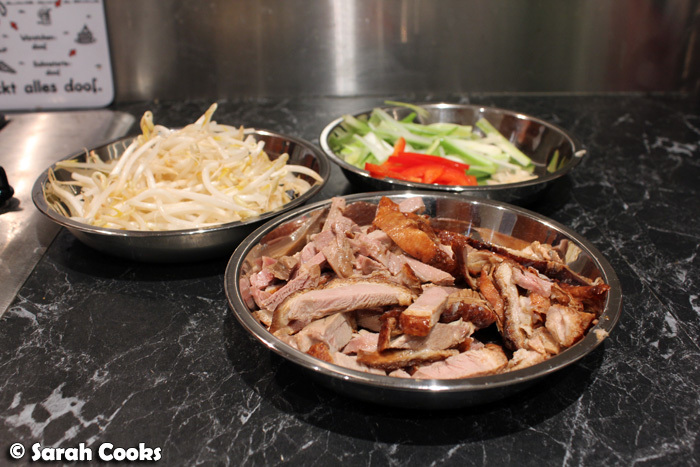 Let's have a look at what we got up to! FYI - we visited quite a few different places, so rather than listing the full address/website/phone number of each venue, the names of the venues are in bold within the text, with a link to the website if they've got one, and with the address following the name in (brackets). I'm trusting you can Google them for further information if any of these places take your fancy! Allons-y! Our first morning in Paris was a Monday, which meant that lots of the cafes and restaurants we had on our "must-visit" list were closed. 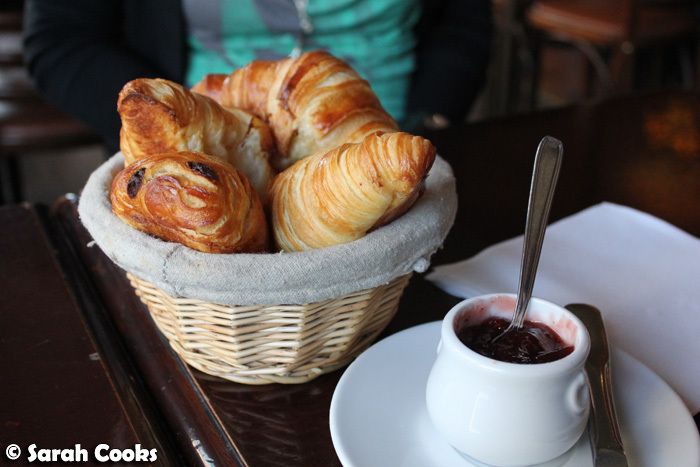 We had a simple breakfast of very good croissants at a local cafe, Le Canon des Gobelins (25 Avenue des Gobelins, 75013), which had the requisite surly waiter and €6.50 cappuccinos - the quintessential experience for tourists in Paris? 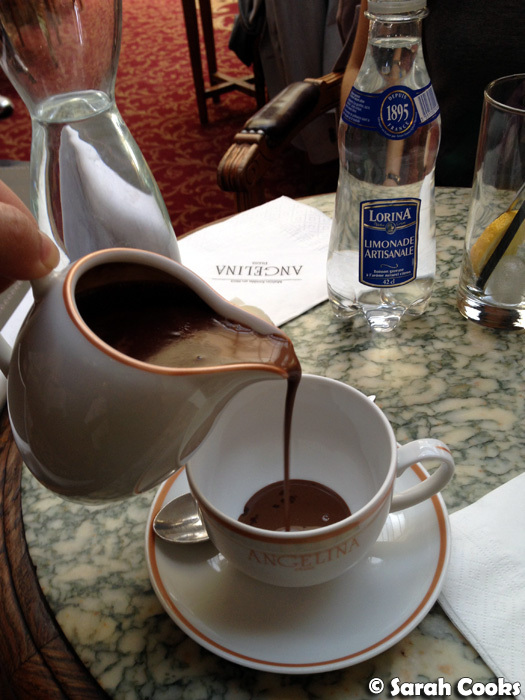 While Sandra and her mum visited the Louvre, Clarice and I walked through the gardens to the nearby Angelina cafe (226 Rue de Rivoli, 75001) for one of their famous hot chocolates. The gardens are stunning, but full of touts hassling you to buy ugly souvenirs like Eiffel Tower keychains - urgh. But, I suppose it comes with the territory when you're in the world's most visited city. 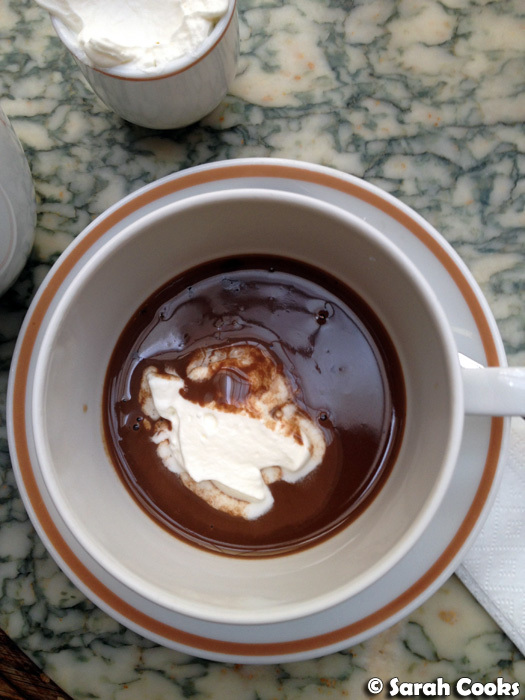 The hot chocolate was beautifully rich and thick, with the whipped cream actually cutting through the richness. I wasn't quite hungry enough to try a Mont Blanc, but Angelina's version is meant to be incredibly good. 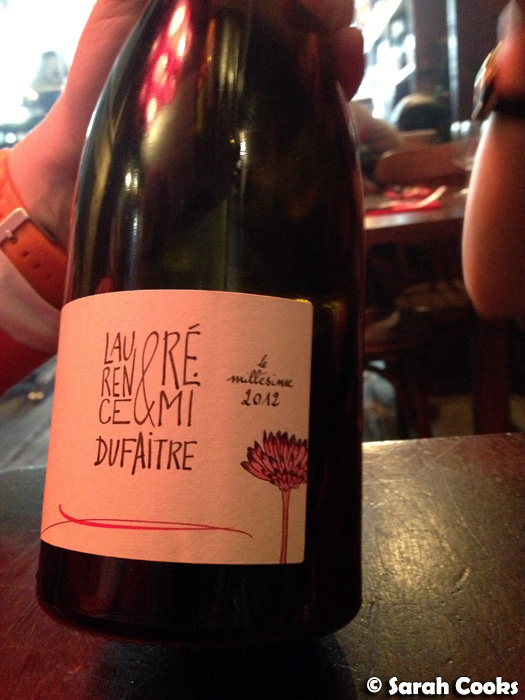 For lunch that day, we headed to Le Garde Robe (41 Rue de l'Arbre Sec 75001), a cosy little wine bar with friendly service, interesting and varied charcuterie, and a cool selection of organic wines. 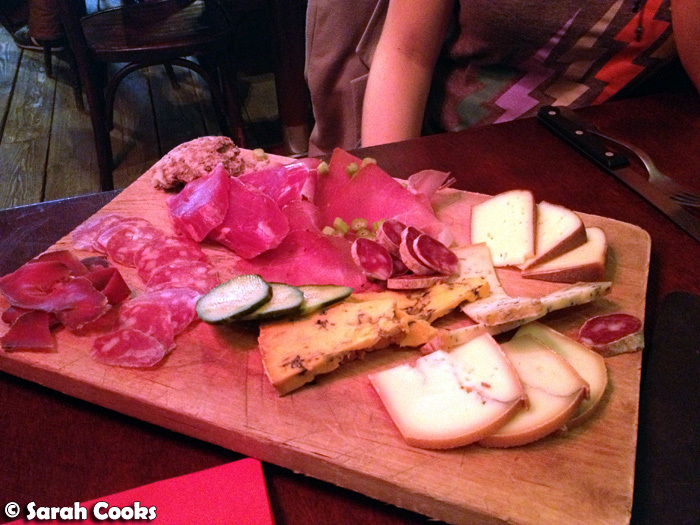 We shared a goats cheese bruschetta and a fantastic platter of charcuterie and cheese, my favourite of which was stinging nettle cheese. 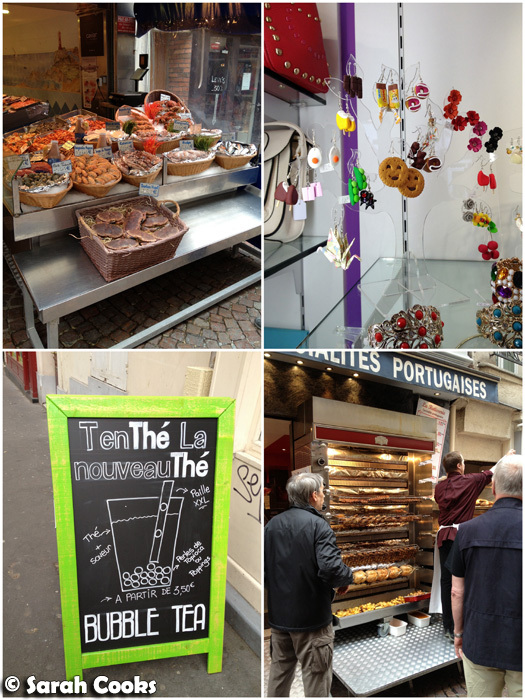 Afterwards we went on a walk through the Marais and the surroundings, having a little nosy through the multitude of cute shops, cafes, boulangeries, pâtisseries and more. I picked up a bottle of coulis de Salidou (Salidou brand salted butter caramel sauce) and some éclats de caramel au beurre salé (little crunchy chips of salted butter caramel) at a wonderful épicerie in the area, which sold all manner of chocolates, sauces, nuts, syrups, spices, dried mushrooms, flours, fondants and other ingredients for professional bakers. 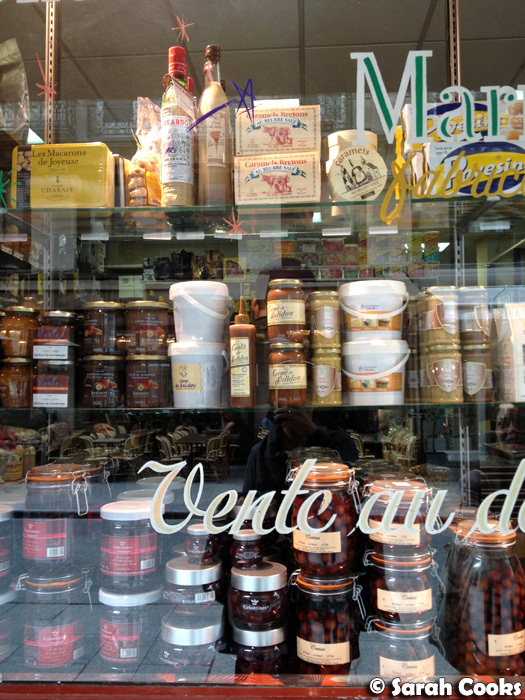 Sadly I can't remember or find the name of it, but here's a picture of the front window (you can see the coulis de Salidou in the centre of the picture, in the squeezy bottle). I still haven't decided what to make with the caramel sauce and caramel chips - I'm thinking crêpes for the sauce and sablés for the chips! 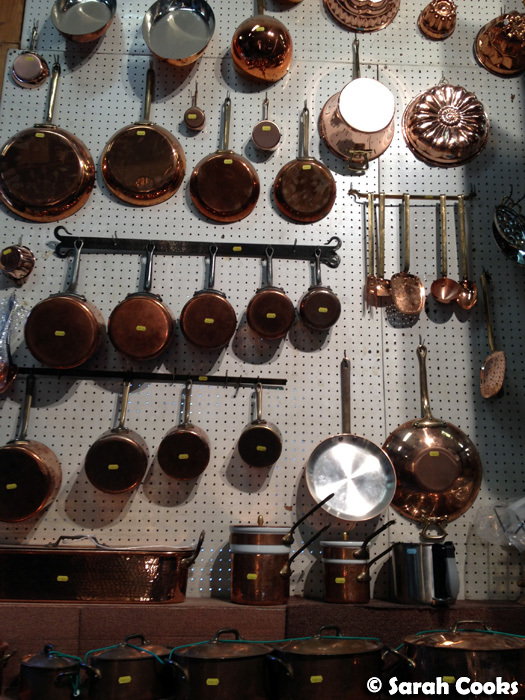 My other favourite shop in the area was the breathtaking E Dehillerin (18 rue Coquillière 75001), a cramped, charming professional cookware shop, with an amazing wall of copper pans and pots. 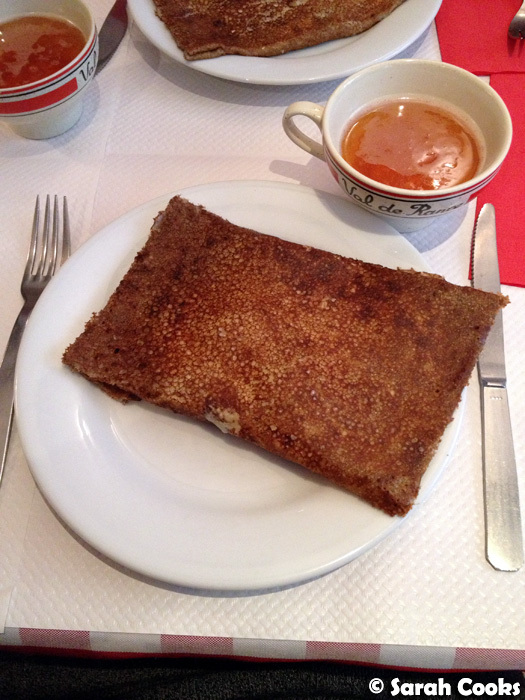 We had buckwheat crêpes and apple cider for dinner at La Crêpe Dentelle (10 Rue Léopold Bellan, 75002). 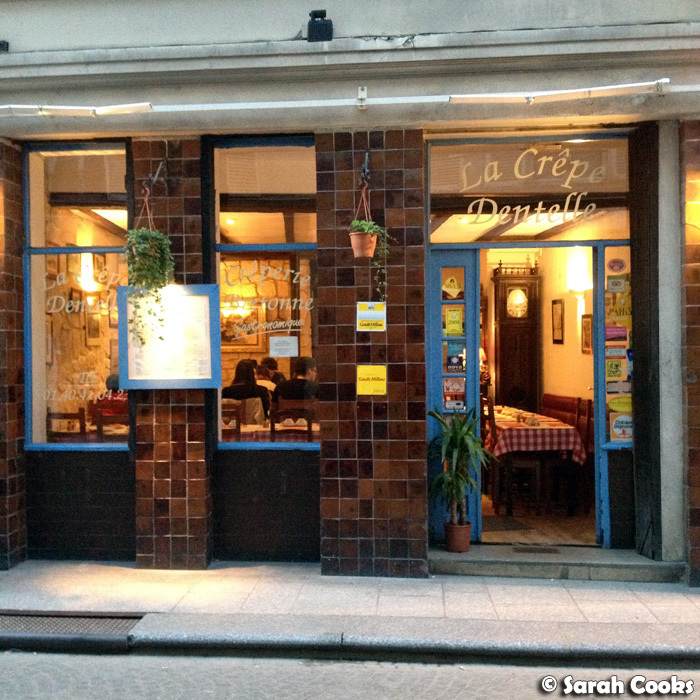 This lovely little crêperie was run by a very sweet Bretagne man, who appeared to be the chef, waiter and owner all in one, and his glamorous Barbara Streisand lookalike wife. We shared a bottle of sweet cider, which we all loved, especially Sandra's mum. Yay! I was a bit worried that she might find Paris a bit too foreign, or strange, or simply exhausting, and was so pleased that she really enjoyed this. She even bought two bottles of "den sehr leckeren Apfelwein" to bring home with her. I took photos of all the crêpes, but now that I look back, I see that I have repeated photos of brown squares on white plates. Hah! 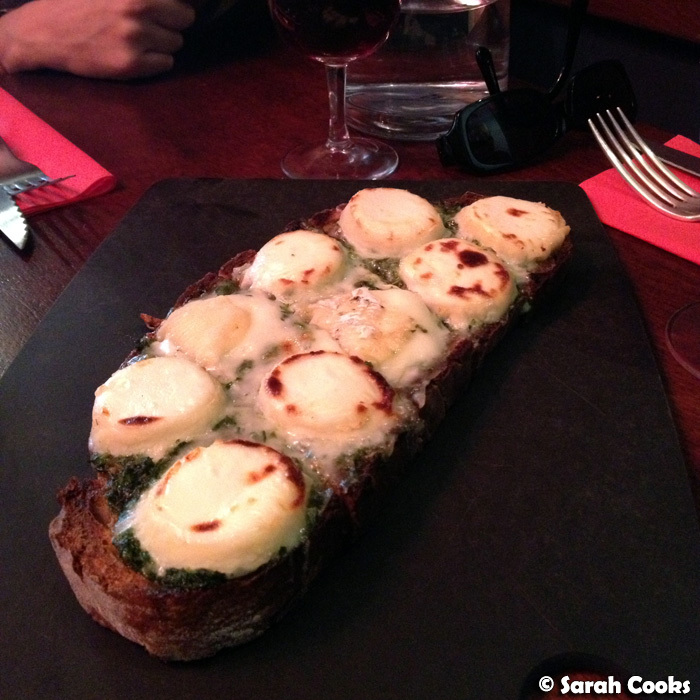 Between us we tried quite a range from their menu, the more unusual of which included: la raclette (raclette cheese, potatoes, country ham and cream) and la canneaise (Camembert and sautéed apples, flambéed with calvados). 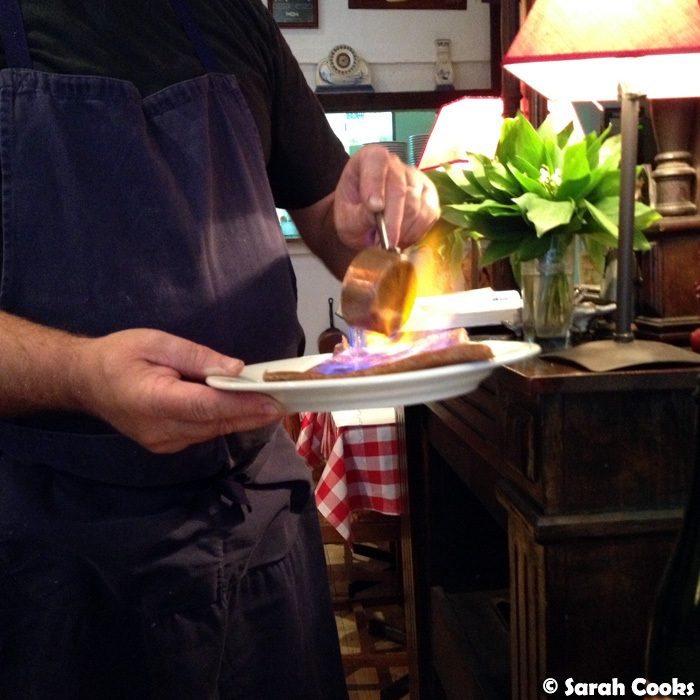 For dessert I had a sweet crêpe with crème de marron (chestnut paste). Delicious! Bright and early the next morning, we made a stop at La Caféothèque (52 rue de l'Hotel de Ville, 75004) for coffee! 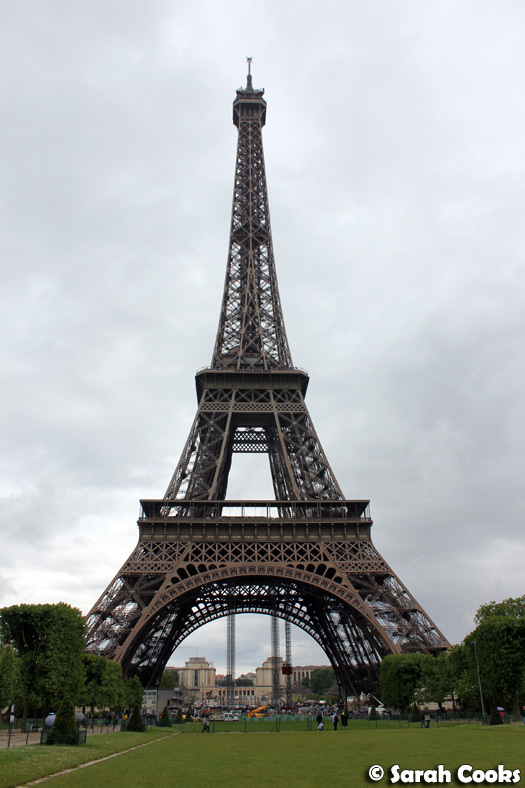 (You may remember I visited the last time I went to Paris, and loved it!) Good coffee in Paris seems, unfortunately, to be the exception rather than the rule, and after a week of dire German coffee and average London coffee, I was totally hanging out for proper espresso coffee, made from carefully sourced beans, with perfectly steamed, creamy milk, and even latte art! (First world problems, I know!) 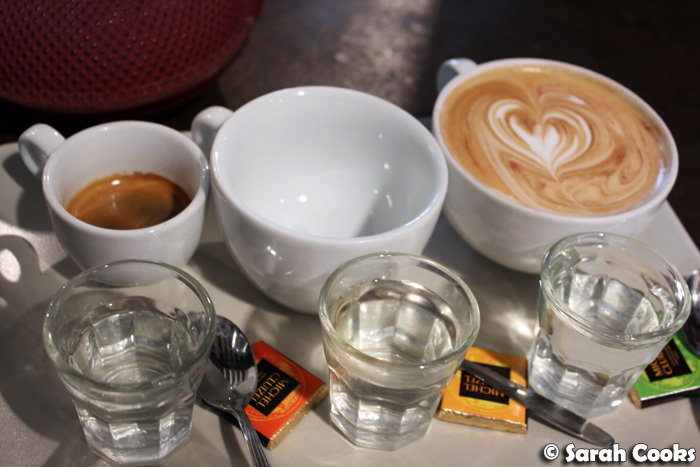 I also liked how the drinks came on a tray with a little glass of water and a square of chocolate - it felt very much like they wanted the coffee to be an experience to be enjoyed and savoured. Galeries Lafayette (40 blvd Haussmann 75009) is my favourite of the big Parisian department stores, especially their food hall and Lafayette Maison, which sells fantastic cookware and has a Pierre Hermé macaron stall. 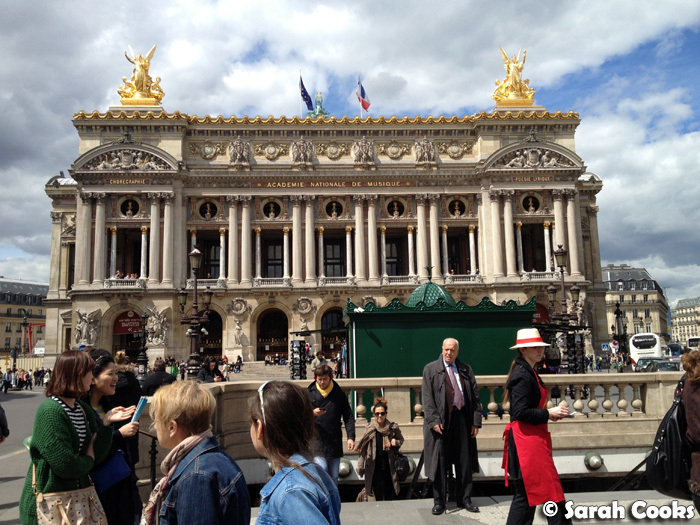 Although the closest metro station is Chaussée d'Antin–La Fayette, if you get off at the Opéra station, which is only one stop away and a very short walk, you get this beautiful view of the Paris Opera! 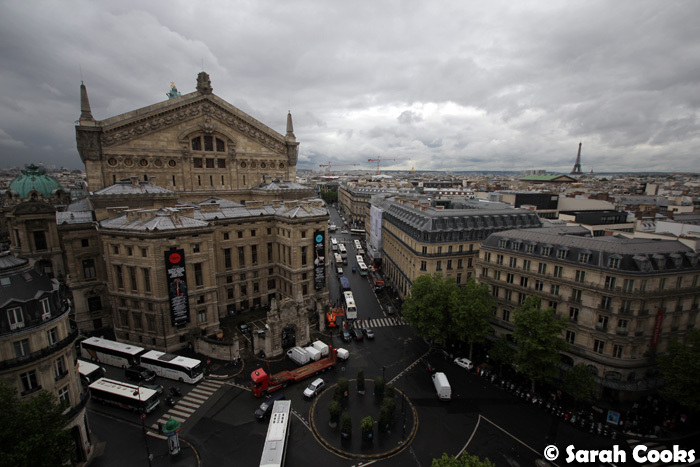 Speaking of views, the rooftop of Galeries Lafayette is a really nice spot to visit, and has excellent views of the city. 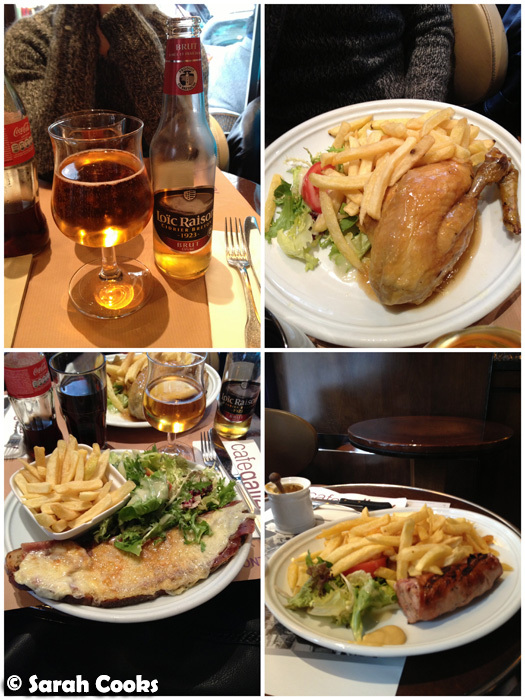 Shopping makes you hungry, and we stopped in at Café Gallery (78 Rue de Provence, 75009) to refuel. 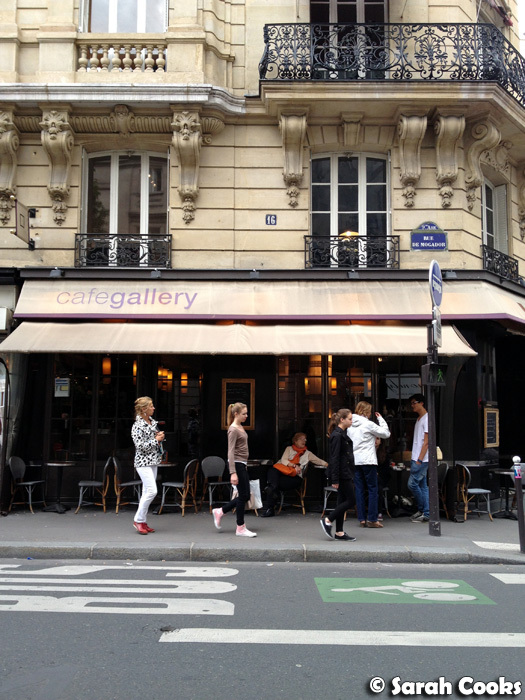 This cafe is located in one of the streets behind Galeries Lafayette, so you will have to navigate your way through literal busloads of shopping tourists! (Sorry). I'm always wary eating anywhere that's in a major tourist location, and would have been racked with indecision if I'd had to choose our lunch venue, but luckily local Clarice pointed us in the direction of Café Gallery, where she and her Parisian boyfriend often stop in for andouillette sausage or tartines made with Poilâne bread. 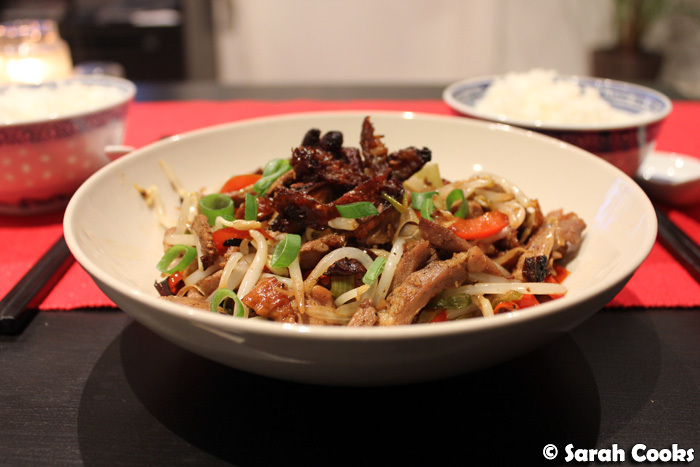 They had generous portions, tasty food, and a friendly atmosphere. 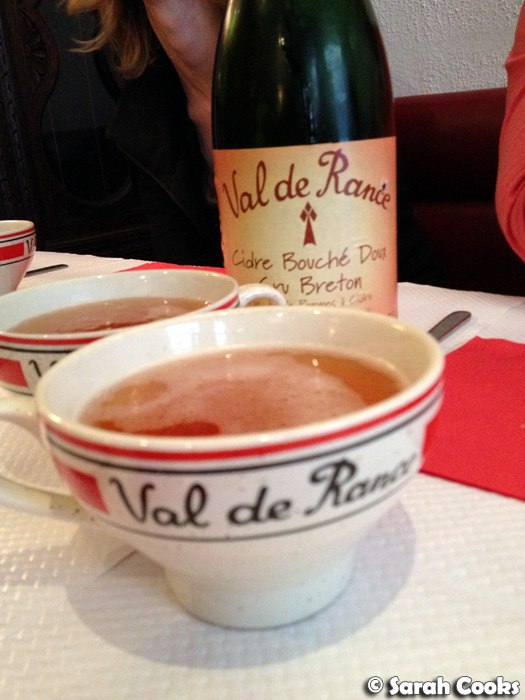 In the above photo we have a cider, roast chicken, andouillette sausage and my country ham and cheese tartine. 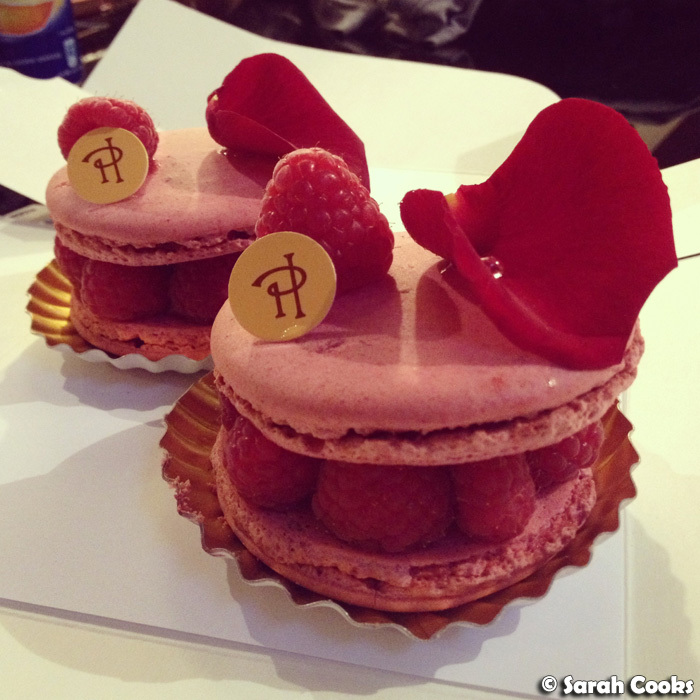 Just as essential as seeing the Eiffel Tower (for me, anyway), was visiting the Pierre Hermé boutique pâtisserie (72 rue Bonaparte, 75006). Whilst there are quite a few Pierre Hermé boutiques throughout Paris, most of them only sell macarons and other packaged products (e.g. biscuits, wafers, granolas, teas, jams, chocolate bonbons etc). The one on the Rue Bonaparte is the only one that sells the actual entremets (pastries), so if you want an Ispahan, or a tarte infinment vanille, you have to come here. 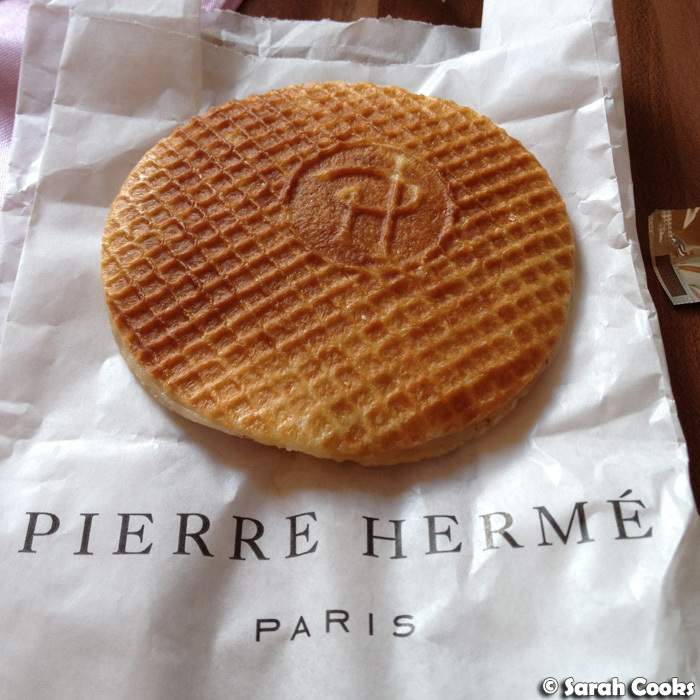 Now, whilst I love Pierre Hermé products, I really do not like the boutique pâtisserie. You see, the way the shop is designed, you are forced to rush through, elbow-to-elbow with other customers, with barely any space to look at the wonderful creations. Suddenly you're at the cash register and you have to make a snap decision without having properly seen the cakes on offer. Luckily I already knew what I wanted, but it does seem to be unnecessarily difficult and rushed. 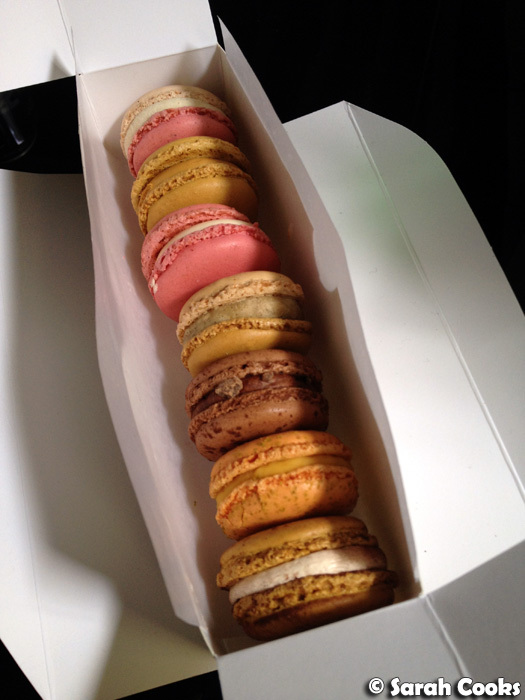 And you know what, when we brought our goodies back to the flat, it turned out they'd given me the wrong box of macarons! I'd specifically requested five Mogador macarons (milk chocolate and passionfruit), and saw the staff member fill the box correctly, but she must have mixed it up with the next customer's. D'oh! We gave them a call and said they'd be happy to swap the macarons over if I brought the receipt, but it seemed like quite a hassle, and more importantly, there are worse things in life than having too many Pierre Hermé macarons! It was pretty cool trying the different flavours too - the chocolate, rose and jasmin, and the salted caramel were my favourites. The next day, I popped back to the Pierre Hermé stand in Galeries Lafayette Maison, which was blissfully calm and quiet, and got my beloved Mogador macarons! (Plus a cassis and a salted caramel, and some other goodies). I love, love, love the box! When she realised I loved the Mogador flavour, the lady at the stand upsold me some Mogador-flavoured chocolate pralines - dee-licious! I also picked up some of these waffles, in both vanilla and Ispahan flavours, but wasn't a big fan, finding them super sweet and not particularly crispy, even when within the use-by date. 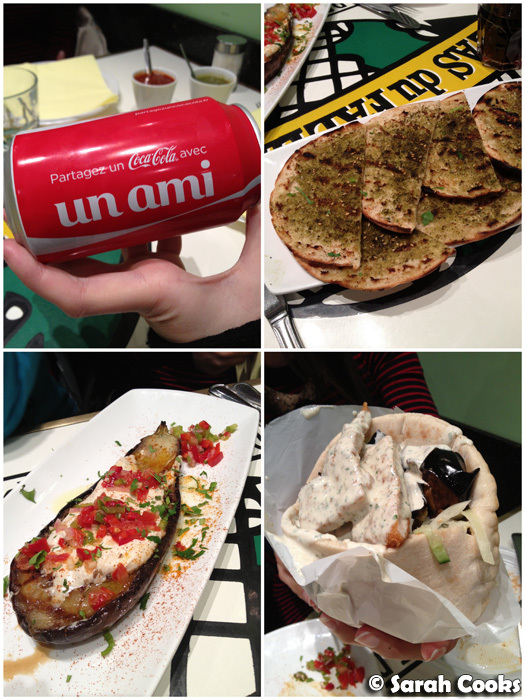 Don't be put off by the menu in four languages and the line of tourists out the door - the food here is really good! Clarice and I were desperately trying to figure out how to recreate the eggplant with tahini sauce at home. 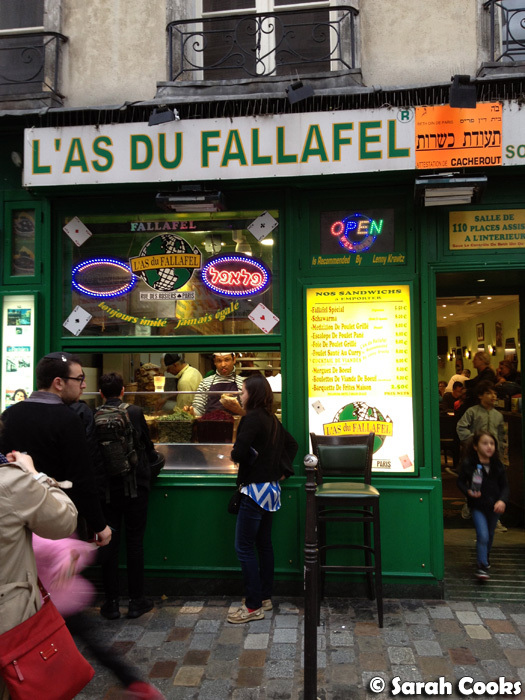 Incidentally, this is a good place to bring vegetarians, who I think would probably struggle a bit in Paris. 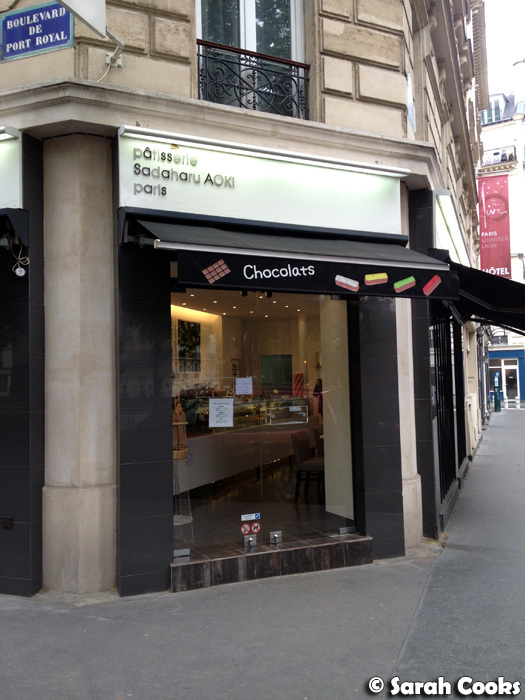 My other favourite pâtisserie in Paris is Sadaharu Aoki (56 Boulevard de Port-Royal, 75005). Clarice and I dropped in for breakfast on my last morning in Paris. 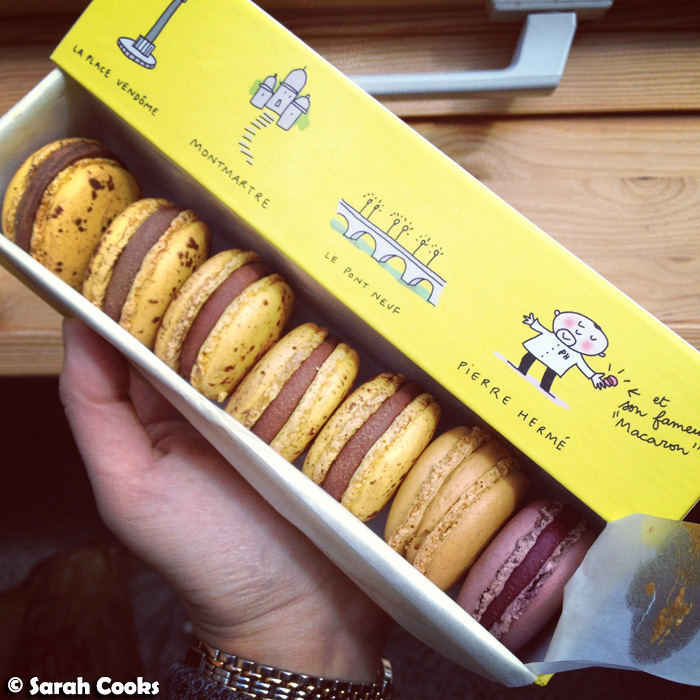 Unlike Pierre Hermé, Sadaharu Aoki is a salon de thé as well as a pâtisserie, so you can actually sit down and eat at the shop, rather than having to take it away. The staff there are always really nice too, and are so patient while I spend ages trying to choose between all the exquisite pastries! 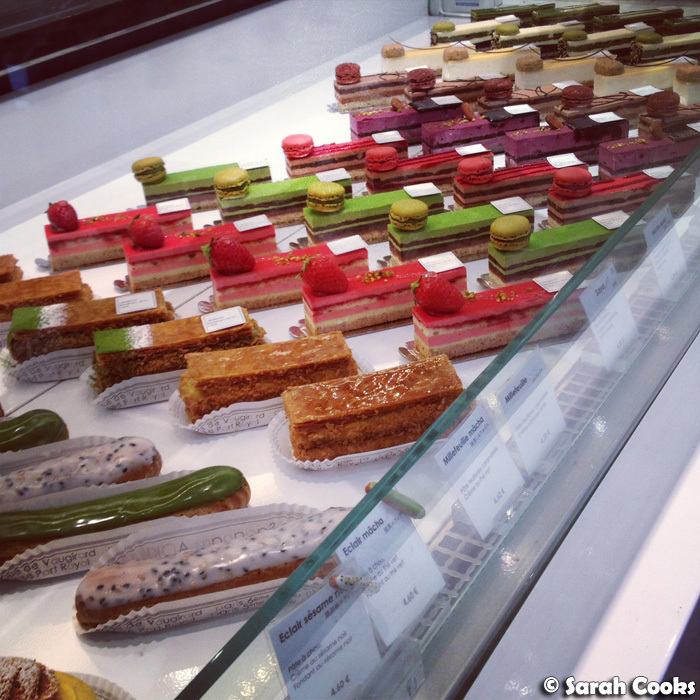 Sadaharu Aoki - note the cute eclair-shaped paperclips! We shared three breakfasty pastries between us, as well as a pot of refreshing genmaicha. 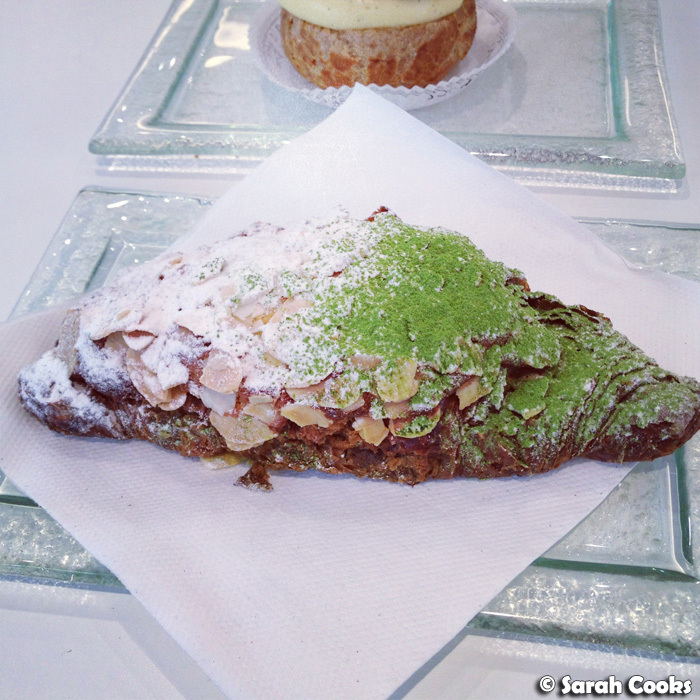 I wasn't a huge fan of the matcha almond croissant, finding it a bit sweet, and with the almond filling getting in the way of the matcha flavour. 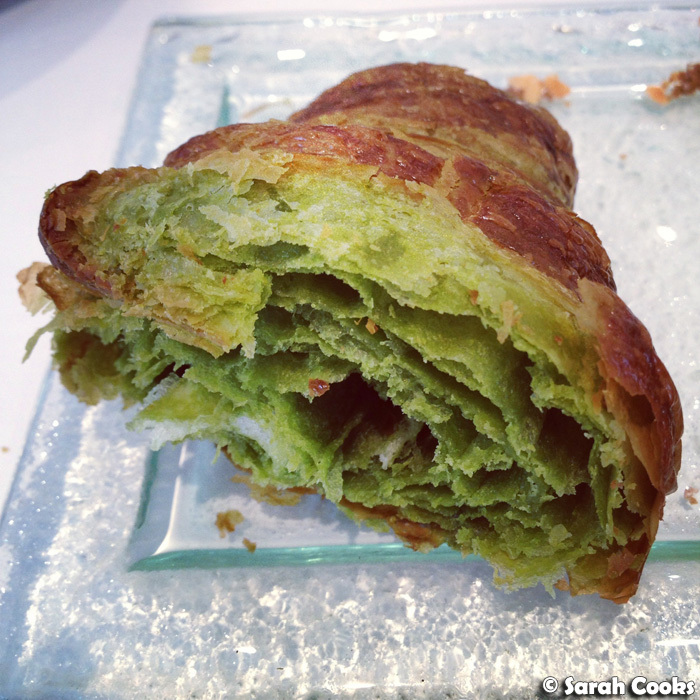 I much prefer the plain matcha croissant (which I fell in love with on my last visit to Paris) - layers of flaky, buttery, green goodness! 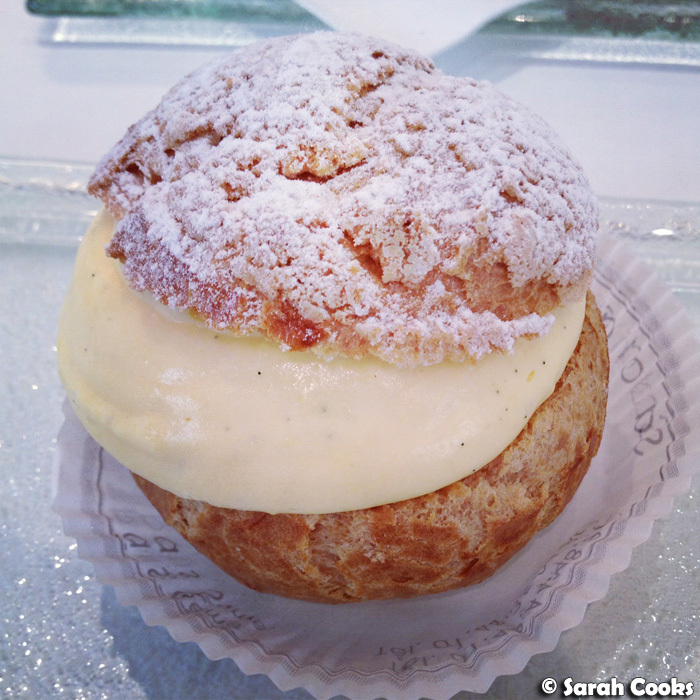 We also shared a chou à la crème (choux pastry filled with vanilla custard and whipped cream). For me, these simple pastries were the most inviting thing in the shop! Look how good that filling looks, it's almost obscene! 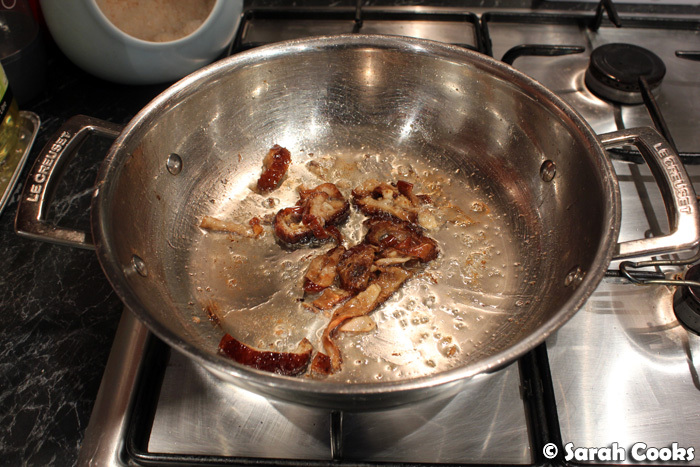 And here's another shot - yup, totally full of that lovely vanilla custard. 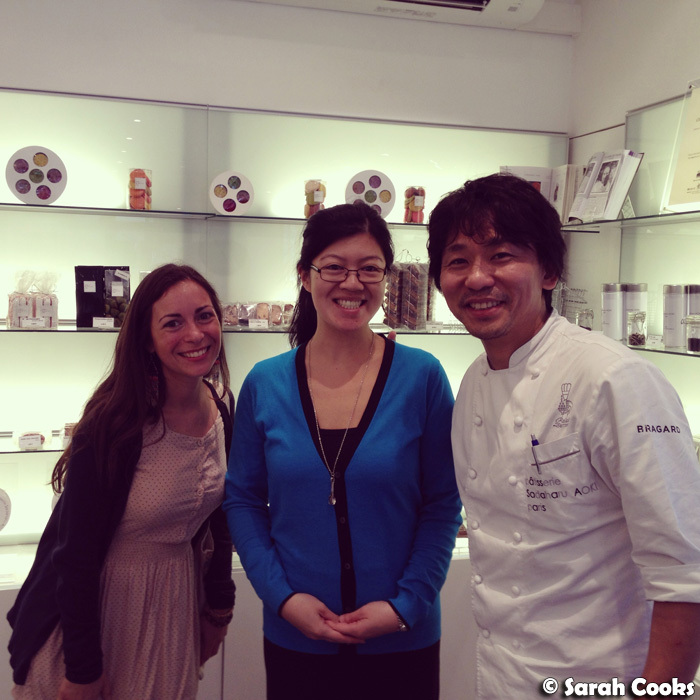 Just as we were about to leave, guess who walked in - none other than Sadaharu Aoki himself! Despite having his name on the door, he seemed really down to earth, and was helping to clear the tables and generally clean up. We'd finished our food, so we got up and left, but then we thought: "Hey, we should ask him to take a photo with us!" So we quickly came back and did! Yay! I was a bit too shy to go up to him directly, so I just asked the sales assistant: "Aoki-san to shasshin wo totte mo ii desu ka?" (Could we please take a photo with Mr Aoki? ), and they were more than obliging! Aoki-san even made sure we stood in a good spot so that we could have a nice background for the photo. Arigatou gozaimashita! 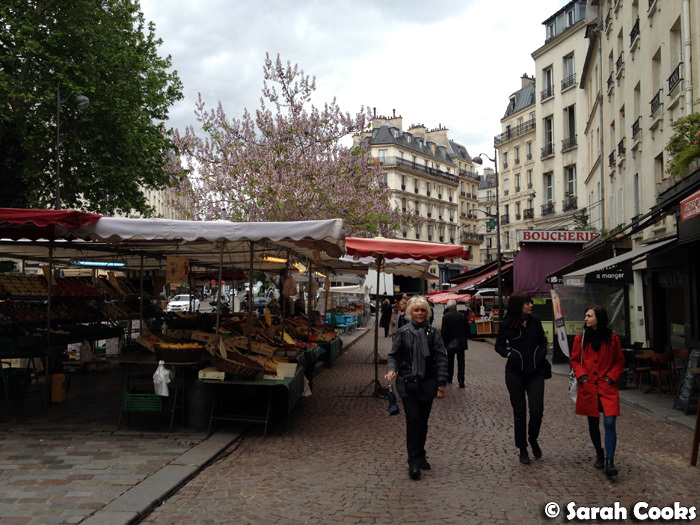 After that thrilling encounter, we all went for a walk on the Rue Mouffetard, one of Paris' oldest neighbourhoods, with lots of great shops, restaurants and an open-air market. 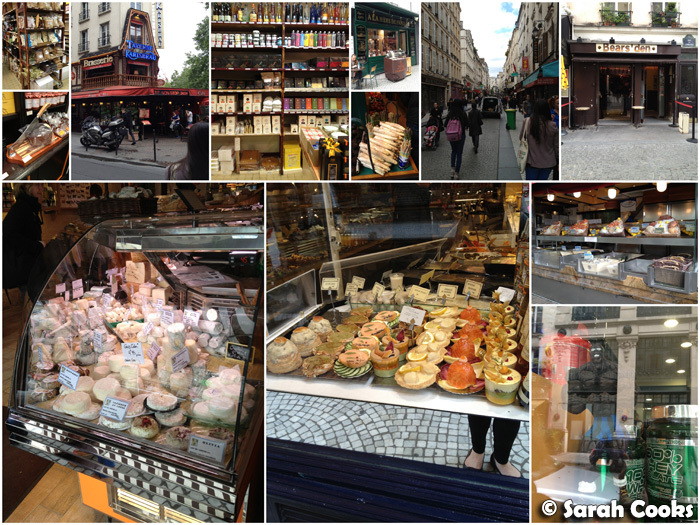 It feels very "Parisian", in that way that we foreigners stereotypically think of Paris: cobblestone streets, fountains, rotisserie chickens, little pâtisseries, delicatessans, and on the day that we were there, even an accordion-playing busker! From a food perspective, there are a couple of destinations that I'd definitely recommend visiting: Le Boulanger de Monge (123 Rue Monge, 75005), a bakery that does fantastic bread (particularly their poppyseed baguettes! 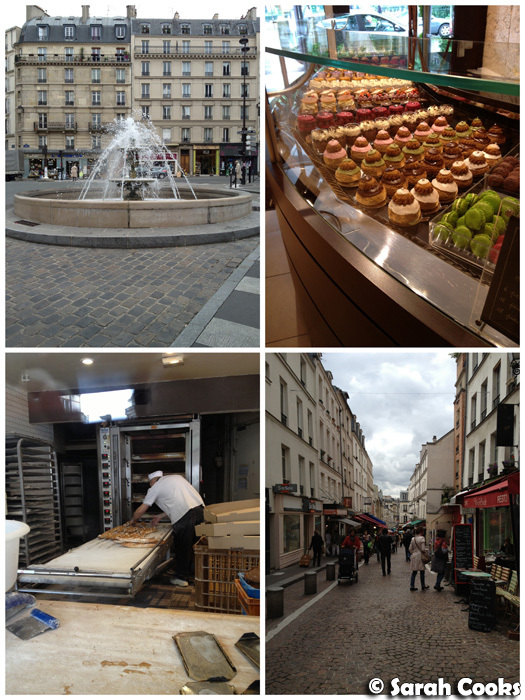 ), and Carl Marletti (51 Rue Censier, 75005), a pâtisserie who have excellent éclairs, religieuses and Paris brests. 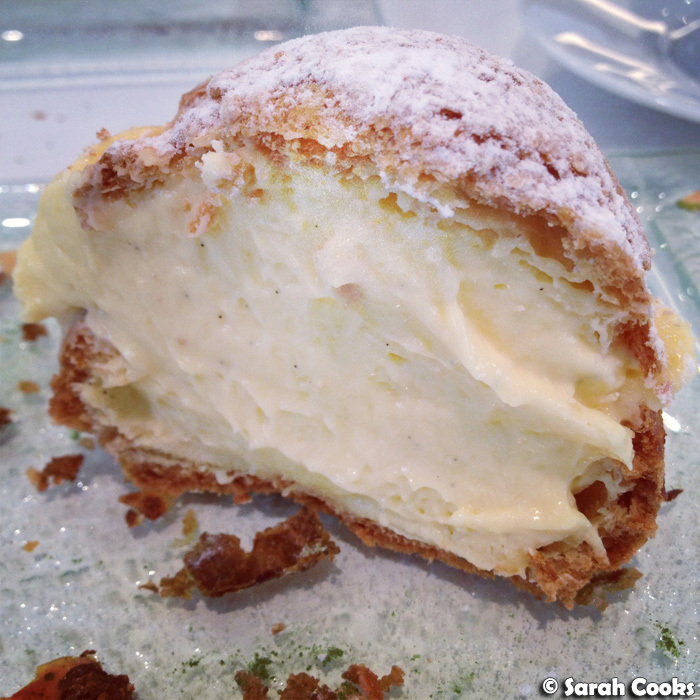 So essentially, they do great things with choux pastry! 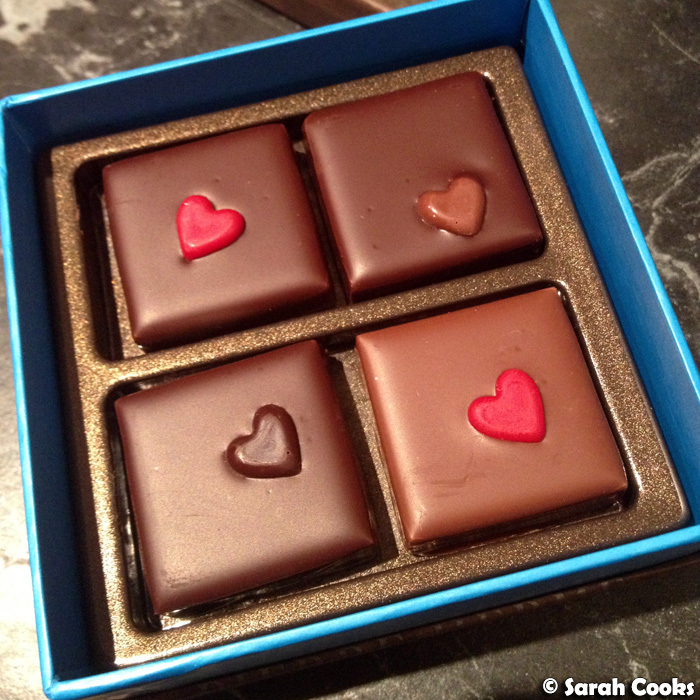 They also focus on classic flavours: think chocolate, caramel and coffee rather than matcha or lychee. 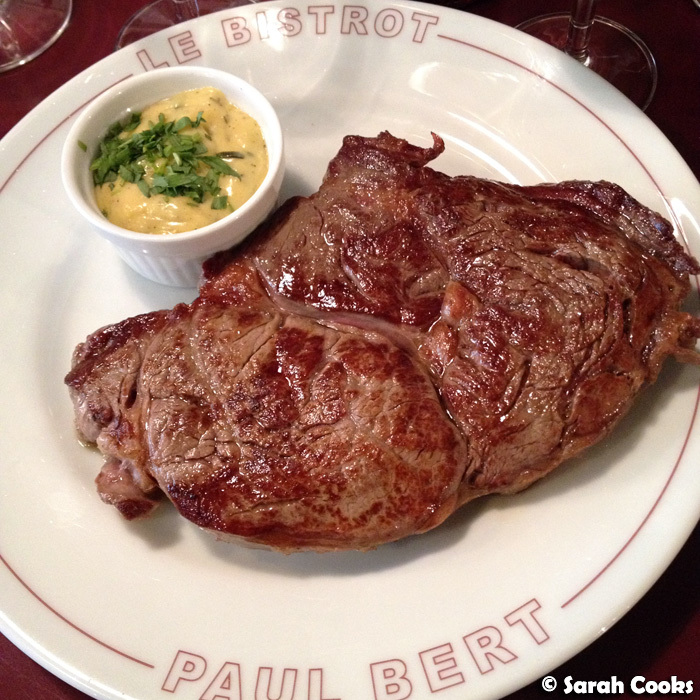 Those rotisserie chickens and roast potatoes looked really tempting, but we restrained ourselves, as we had a booking at Bistrot Paul Bert (18 Rue Paul Bert, 75011) for lunch. 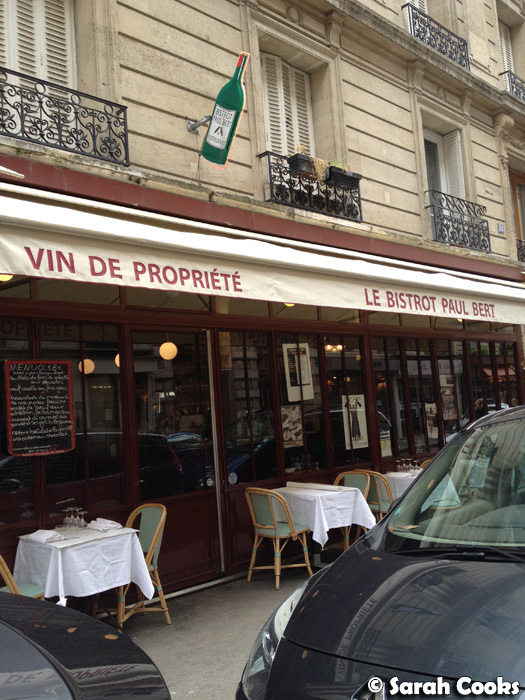 Prior to the trip, we'd been tossing up between Bistrot Paul Bert and nearby Le 6 Paul Bert - both have the same owners and are well known for good food. 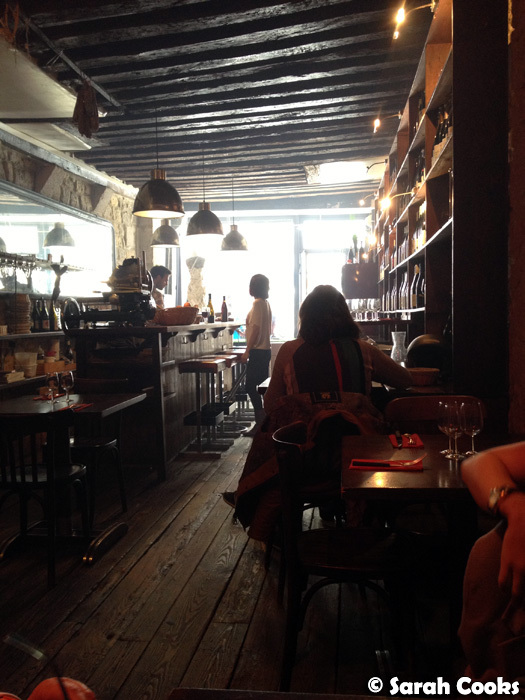 (Check out David Lebovitz' blogpost on Le 6 - looks amazing and not too expensive!) The Bistrot does more traditional, hearty fare, whereas Le 6 seems to be a bit more experimental - think Bistro Thierry as opposed to Vue De Monde. In the end, we decided on the Bistrot as it seemed like a bit of a safer option that all parties on our trip would enjoy. 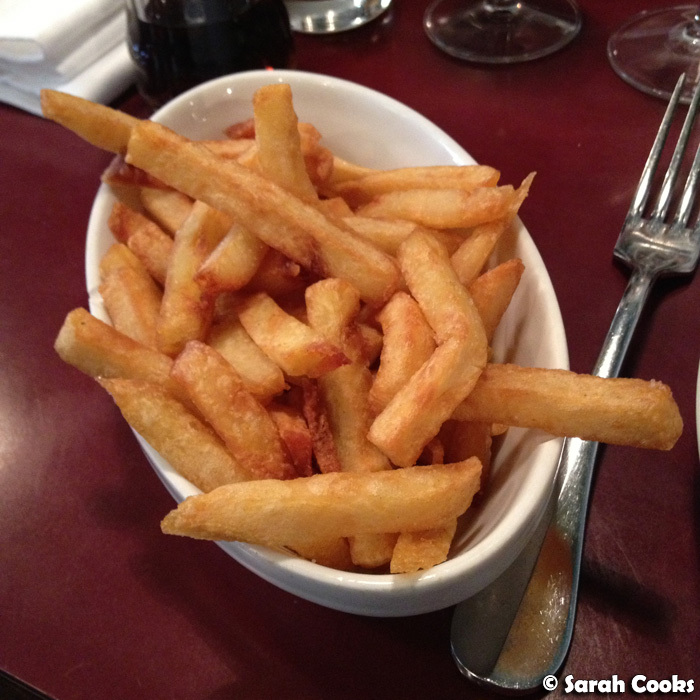 Now, Clarice didn't join us for this lunch, so I had to do all the French talking - scary! I was pretty good at high school French, but haven't spoken much since then, and whilst I can get my point across, I struggle to sound natural. Don't laugh, but before the lunch I'd quizzed Clarice on the right phrases to use and practised them with her: "Nous pouvons avoir l'addition, s'il vous plaît? ", "J'aimerais bien une verre de vin rouge", "Oui merci, c'est gentil", "Une entrecôte, pas bien cuite", and so on. It must have worked, because the waiters understood me, they were very polite and sweet, we received all the food and drinks I ordered, and they didn't speak back to me in English. 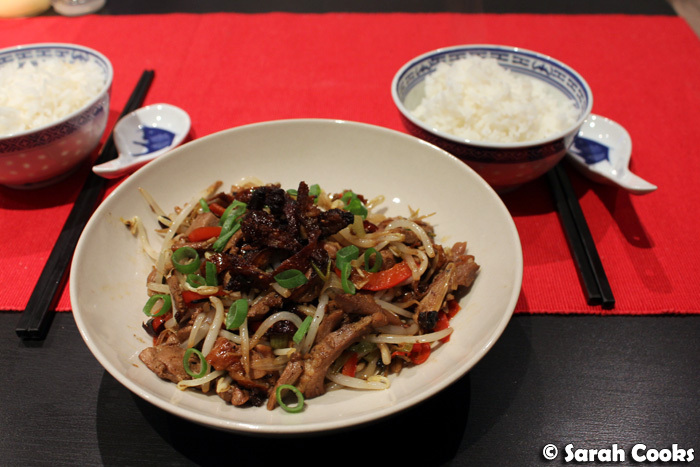 I even managed to translate parts of the menu into German for Sandra's mum! HELLZ YES I AM A LANGUAGE MACHINE. They had two three-course fixed price lunch menus - one at €36; the other with slightly simpler fare at €18. Bargain!! The whole menu looked awesome (well, what I could understand, anyway! 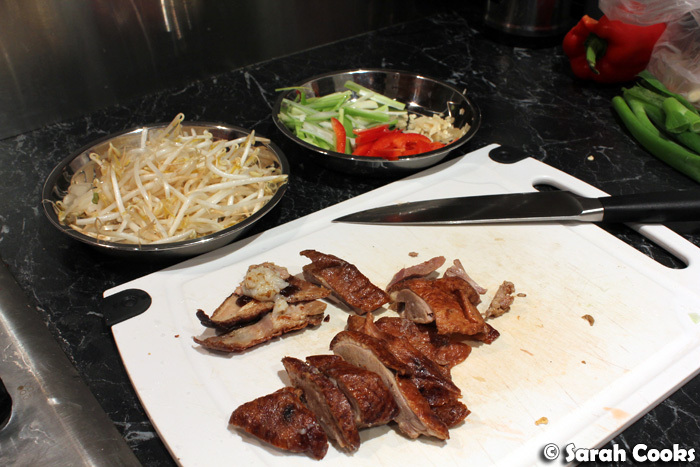 ), but given the incredible amount of food we ate over the three days, we decided to only have one main dish each, and shared two desserts between the three of us. 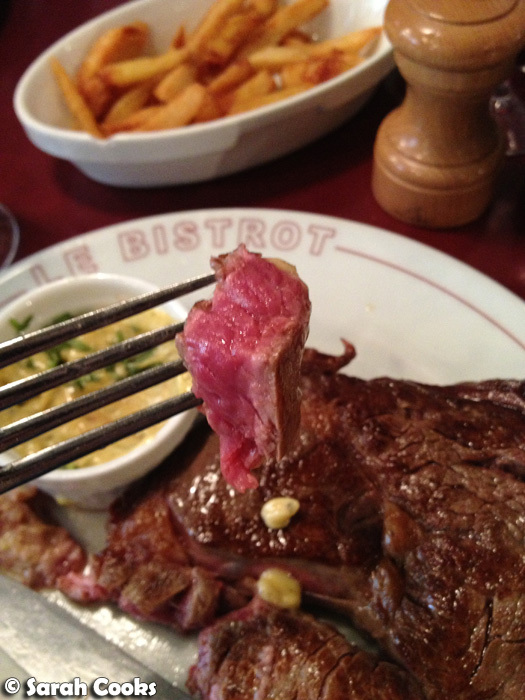 I had to go for the classic steak frites, with béarnaise sauce - my favourite! The steak was huge, and cooked just as I wanted it, and the fries were a fantastic mix of crunchy and fluffy. A perfect lunch. 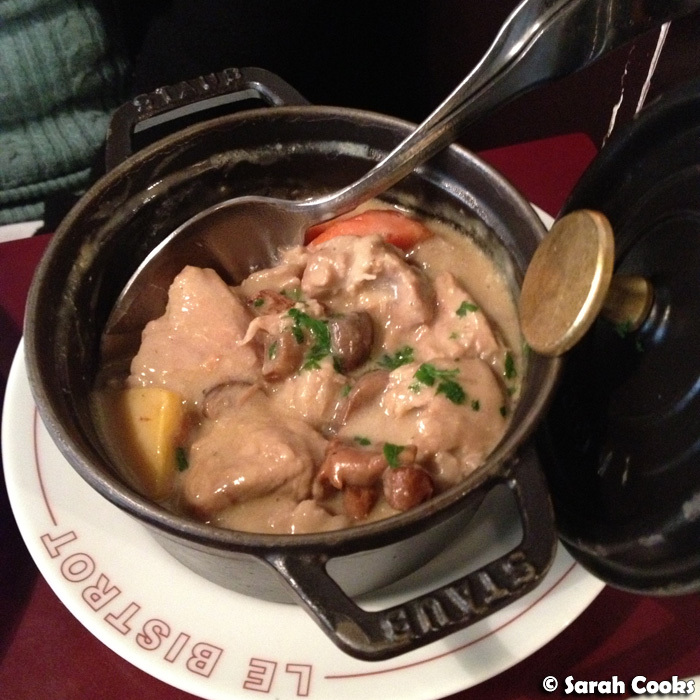 Sandra had the blanquette de veau aux girolles (creamy veal ragout with chanterelle mushrooms), which came in this cute little Staub pot and was served with steamed rice. Sandra's mum had a simple but delicious hanger steak with onion sauce and housemade fries from the €18 menu. 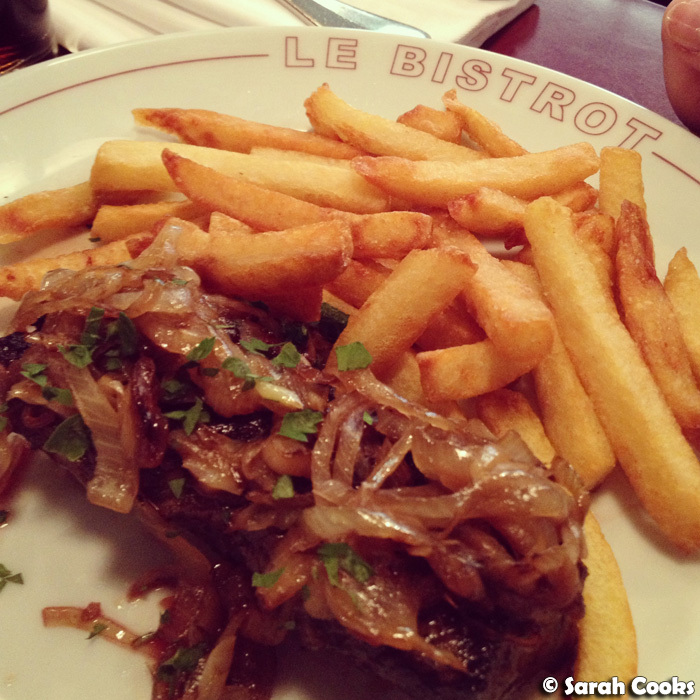 (In French it's known as onglet de boeuf aux echalots, frites maison, in German: Zweibel Steak mit Pommes). Now, we didn't really need dessert (does anyone, ever, actually "need" dessert? 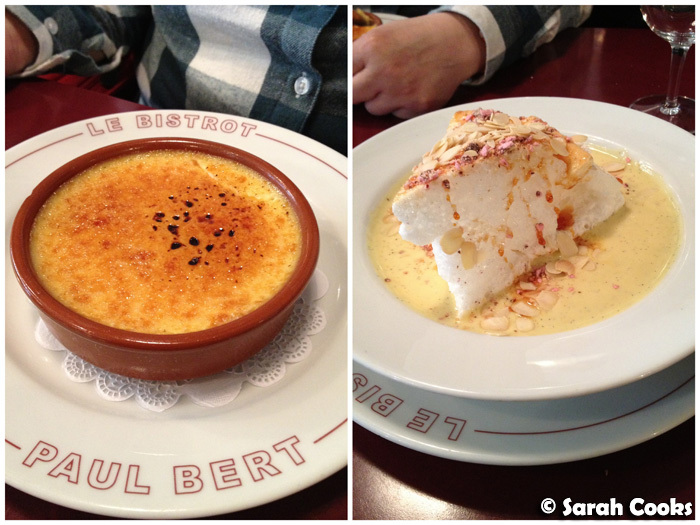 ), but I'd heard great things about their île flottante and just had to try it. It was a massive wedge of soft poached meringue, swimming in cold vanilla bean custard, and topped with crystallised roses and almonds. Very delicious, but I must admit I liked the classic crème brûlée even more - a very rich, thick vanilla-bean custard topped with a perfect crackly sugar topping. And finally, we did a bit of last minute shopping (Uniqlo, Muji, Lafayette Maison yet again! 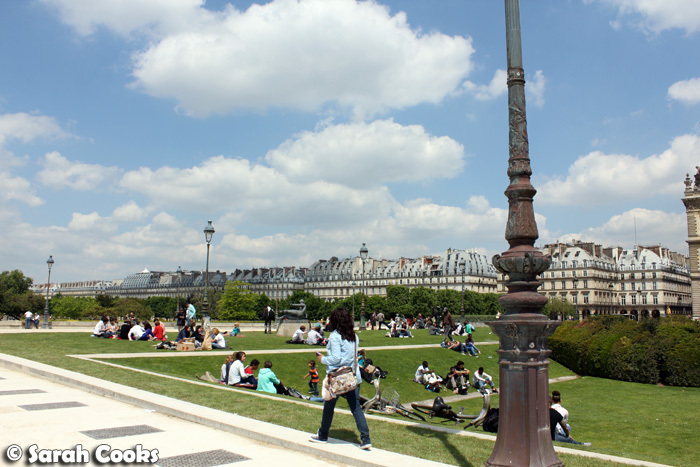 ), a bit of walking, and had a Berthillon ice-cream on the Île Saint-Louis to finish off the trip. 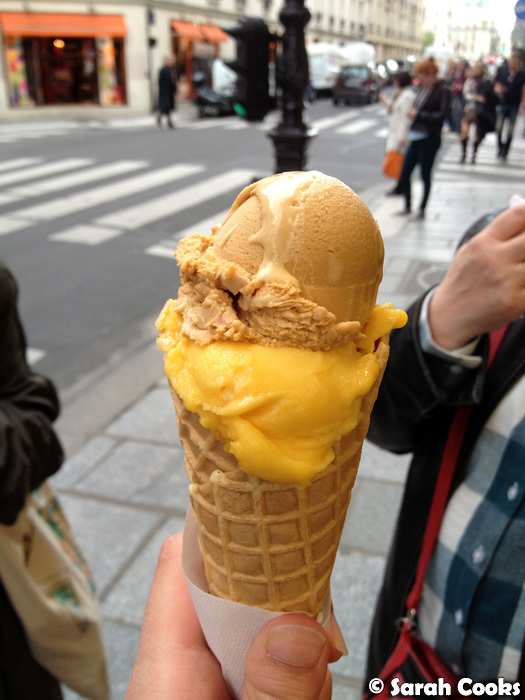 I had a caramel au beurre salé (salted butter caramel) and passionfruit. The last time I went to Paris, I promised myself that the next time, I'd visit the Berthillon salon de thé to have a tarte tatin with salted butter caramel ice-cream, but we didn't have a chance on this trip. Just an excuse to make another trip back in the future!